Mike Lonigro, President of the Upper Hudson Central Labor Council announces the endorsements. In addition, 6 more candidates were recommended tonight for endorsement. Those recommendations will be ratified at the UH CLC Kingston meeting, Monday September 26, 2011. 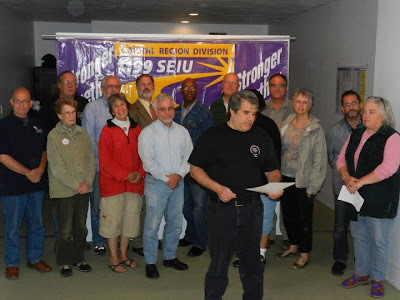 Tonight the Hudson Valley Area Labor Federation and the Upper Hudson Central Labor Council Columbia Chapter announced its endorsements in the 2011 Columbia County elections. The announcements were made inside the SEIU 1199 offices in Hudson, NY. 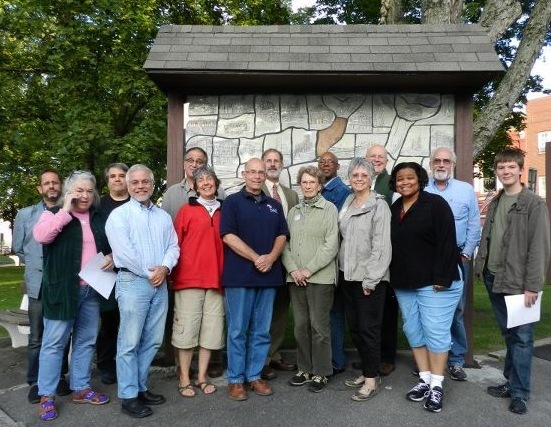 “The Upper Hudson Central Labor Council is pleased to be making endorsements in this year's elections. As we get further into the election season we will be working to see our candidates elected. Pandering to wealthy corporations has not produced the jobs we need locally. By working with the Hudson and Columbia Democratic candidates we will put our local economy back on track,” said Mike Lonigro, President of the Upper Hudson Central Labor Council. “We have great candidates in Columbia. We will unite to protect Columbia’s middle class and save jobs and services,” said Paul Ellis-Graham, President of the Hudson Valley Area Labor Federation. "The healthcare workers of 1199SEIU are looking forward to providing the "boots on the ground" in order to elect the candidates who understand and are committed to solving the problems that working families face today. All politics is local--and we are taking these races very seriously," said Antonella Pechtel, Political Director, 1199 SEIU Hudson Valley/Capital Region. “The Columbia County Democrats, together with the Central Labor Council, will keep fighting for this county’s middle class. We say no to the extreme right’s anti-worker agenda and are committed to saving jobs,” said Cyndy Hall, Chair of the Columbia Democrats. "The Hudson City Democratic Committee is grateful to have labor’s support in this years election. The support of organized labor helped our five excellent candidates who faced primaries, to win those races by unheard of margins. Together, we will go on to win in November and to change Hudson and Columbia County,” said Victor Mendolia, Hudson City Democratic Chairman. “Collective bargaining works when management and labor negotiates from positions of respect. The HVALF/UHCLC endorsements mean that within this field of candidates for Columbia County offices there is respect for organized labor. Such mutual respect is a building block for a fair deal for workers and taxpayers,” said Ernie Reis, a retired teacher and member of the New York State United Teachers says. This announcement emphasized the desire by both Labor and candidates running for office to work together to bring good government that will serve the middle class during this very difficult economic downturn. For many years Columbia wanted the support of Labor, and it was through the hard work of Mike Lonigro, Beth Soto, Director of the HVALF and the Columbia Community that this coalition was formed.